Great article Donnie. As I started presenting (still only a handful of presentations done) I found that the best thing I did was to force myself to do a rehearsal in front of a well seasoned speaker. He subsequently recut my presentation, got rid of the bullet points, deleted all my notes and moved the bullet points to the speaker notes. After the mild panic attack it was actually the best thing ever for my presenting ability. I found that when I had specific sentences that I was trying to deliver I would lose the whole flow of the presentation. Using speaker notes, I was then only talking to points. Also: Do not write a short novella in 6pt font that fills an entire page. If you shrink the slide down so that the width is approx 4 inches (10 cm) and you can no longer read the text, your text is too small. First off, great post, I’ll try following it. There is one thing however, that baffles me : What “should” be on the slides? I’m at uni, and all courses are terrible/useless ppt presentations with theorems all over. 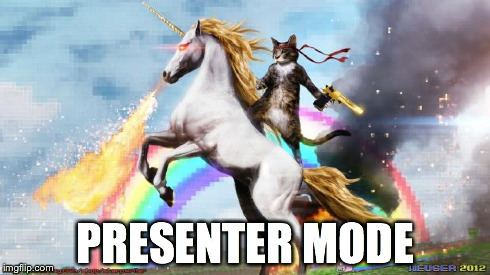 We even had a course that taught us to do presentations, and it went along the lines of “bullet points are the holy grail”. I’m also left wondering if different kinds of presentations are for different cases? The only good use case for presentations full of text-heavy slides is if you aren’t presenting them, but instead they’re meant to be read by the viewer on a site like Slideshare. Of course there are exceptions, like if you’re deriving equations, but I’d argue that’s best done in a different format than slides.